CALL US AT 248-652-0450 TO MAKE YOUR APPOINTMENT! Red eared sliders are semi aquatic turtles that are very commonly kept as pets. Unfortunately, lack of understanding what they require means that many red eared sliders have died from improper care. While they are not overly demanding as pets, many unsuspecting owners have been told that it was fine to keep them in small plastic bowls. Needless to say this housing is completely inadequate and impractical - turtle owners need to invest a fair amount in the proper equipment to house red eared sliders. Once housed properly they are quite easy to care for, and with the proper care these turtles can live 75 years or more, so turtle ownership is not a commitment to be taken lightly. 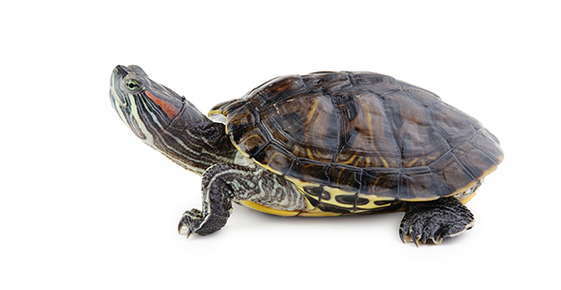 A full grown red eared slider can reach 12 inches in length (measured as the carapace, or top shell, length). Males tend to be smaller than females, but have large claws on the front legs and longer tails than females. In the US, sale of red eared sliders under 4 inches in length have been banned since the 1970s. The ban was a result of the prevalence of Salmonella infections linked to pet turtles. Baby turtles were very popular as pets for small children, mostly because a lot of people did not realize the cute tiny turtles sold in pet stores could carry Salmonella or that they could grow so large. Red eared sliders are omnivores, meaning they eat a mixture of animal and plant material. Younger turtles eat more animal protein than adults, though. Juveniles should be fed daily, but adults can be fed every 2-3 days. Turtles can be fed a mixture of prepared commercial food and fresh food. Special food formulated for turtles can be used, but this should not make up any more than 25% of the total diet. Another 25% of the diet should be made up of animal protein, and can include live feeder fish, earthworms, crickets, waxworms, cooked chicken or lean beef, and aquatic snails. Young turtles can be feed smaller feeder items such as blood worms, shrimp, dapnia and krill. The remainder of the diet (up to about 60% of the adult diet) should be made up of fresh greens, vegetable, and fruits. Good choices for greens include collard, mustard and dandelion greens, butter lettuce and other leaf lettuces (but never iceberg lettuce). Carrots (tops are fine too), squash and green beans can be shredded and offered. Fresh fruits can be given too, shredding hard fruit like apples and chopping softer fruits such as bananas and berries. Cantaloupe can be given with the rind on as turtles seem to enjoy gnawing on the rinds. A good quality complete reptile vitamin and mineral supplement should be added to the food once or twice a week. In addition, extra calcium can be provided by giving turtles a cuttlebone (break into pieces and float in the water) or calcium block to nibble on. Red eared slider turtles are semi-aquatic and spend a significant amount of time basking, so need a tank that provides both water for swimming and area where they can get out for basking. A 20 gallon tank is considered a minimum, though larger turtles will need a larger tank to provide ample swimming room so even if you have a smaller turtle you might want to invest in a larger tank to allow room to grow. You do not need to use an aquarium though - large plastic containers or storage tubs are fine as long as you don't mind not being able to view the turtles from the side. As long as the tank is tall enough and the basking area is positioned so that the turtles can't climb out you won't need a lid. The basking area can be provided by stacking smooth rocks, sloping smooth large gravel to one side to make a land area, or using wood (fixed or floating). However you design the tank though, keep in mind that turtles are messy and you will need to clean the tank frequently. No gravel is required in the tank but if you choose to use it make sure it is large enough that it won't be accidentally eaten. Red eared sliders need an adequate amount of water to move about and swim a bit. You can judge if there is enough water by looking at the length of your turtle. The water should be at least 1.5 to 2 times as deep as your turtle is long (so a 4 inch turtle should have a minimum depth of 6 inches). The length of the water area should be 4-5 times the length of the turtle, and the width should be at least 2-3 times the length of the turtle. Between feeding and defecating, turtles are pretty messy creatures. A turtle tank should include a good filtration system such as a power filter or canister filter, or an undergravel filter system. Filtration will reduce the frequency of water changes, but your turtles will still require 25% water changes weekly and a thorough cleaning once a month or more. It is best to feed your turtle in a separate container to minimize the mess in the tank and reduce the load on the filtration system. A submersible heater should be used to keep the water at 75-86 degrees F. Get a good aquarium thermometer and monitor the water temperature. Turtles will want to investigate the heater so it is best if you can turtle proof it by placing it behind something so the turtles can't bump or move it. A heated basking spot should also be provided in the area provided for the turtle to get out of the water. An incandescent bulb or spotlight can serve this purpose, but make sure there is no way the turtle can touch the light or that the light can fall into the water. The temperature at the basking spot should be 85-88 F. Watch the water temperature when the basking light is on as it may heat the water. The ambient air temperature around the tank should ideally be about 75 F. If the turtle's room is cooler than this you should provide extra heat in the tank area. A ceramic heat element used near the tank works well for this purpose since it can be left on day and night. In addition to the basking light, a full spectrum reptile UVA/UVB light should be provided. Exposure to UVA/UVB is necessary for proper calcium metabolism, and also appears to have other benefits to overall health such as improving appetite. It is also nice to take your turtle out into natural sunlight in warmer weather.